Ketamine provides significant short term pain relief for chronic pain patients in a new clinical trial. This potentially offers a new treatment option for patients who cannot take advil or opioids. However, it comes with some side effects. A new clinical trial shows that ketamine may be useful in treating chronic pain exacerbations. Patients with chronic pain can have short episodes of much stronger pain alongside their long-term chronic pain. These episodes can be extremely uncomfortable and often lead to Emergency Room visits. Current treatments for these episodes of pain include advil and opioids. However, not all patients may want to or be able to take these medications. A new study sponsored by the Department of Defense and conducted at UCLA showed that ketamine may help these patients during these acute pain episodes. Researchers split 103 patients to take either high dose ketamine, low dose ketamine, or a salt solution as a control. Researchers found that 80% - 83% of patients given ketamine had a significant reduction in their perceived pain. Meanwhile, only 41% of patients given the control, not containing any drug, experienced decreases in their pain. Ketamine infusions at both 0.5 mg/kg and 0.25 mg/kg over 20 minutes were effective in acutely controlling pain in a group of patients with chronic pain when compared with placebo. Source: Subdissociative Dose Ketamine Is Effective for Treating Acute Exacerbations of Chronic Pain. Figure 2: Ketamine Effectiveness after 24 Hours. 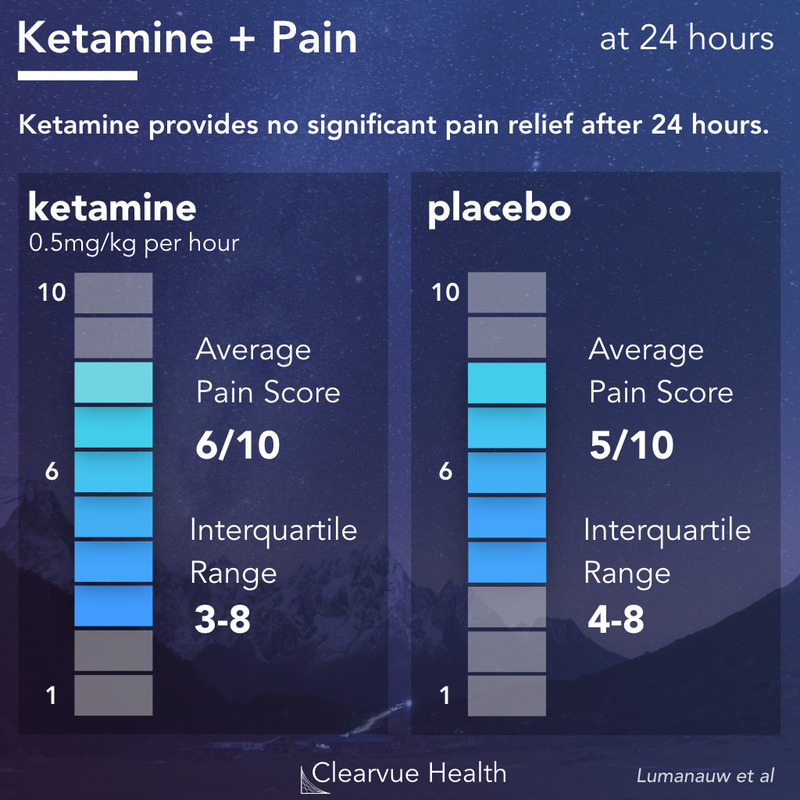 After 24-48 hours, patients who had taken ketamine showed no differences in pain compared to patients who had taken a placebo. The middle 50% of ketamine patients reported a range of 3/10 to 8/10 for their perceived pain. The middle 50% of patients who took a placebo reported a range of 4/10 - 8/10 for their perceived pain. After 24-48 hours, the effectiveness of ketamine wears off, suggesting that ketamine is primarily effective for short term pain relief. Researchers followed up with patients 24-48 hours after they left the Emergency Department to see whether the pain relief persisted. 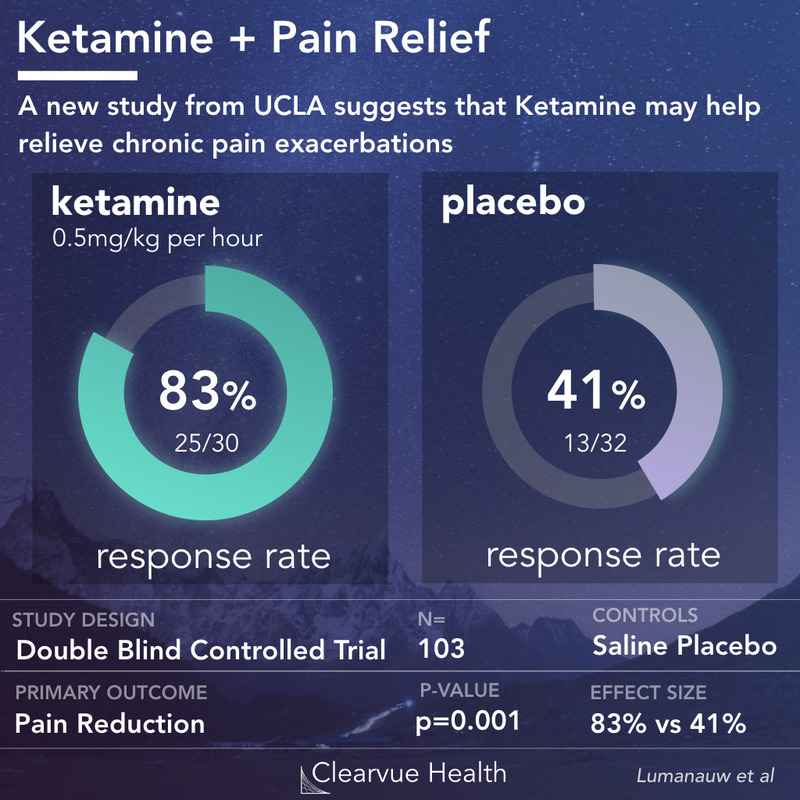 They found that there was no difference in pain between patients who had taken ketamine compared to patients who had taken the placebo control. This shows that while ketamine is highly effective for short term pain, it is not suitable as a long term pain treatment. Figure 3: Top Side Effects for Ketamine in Chronic Pain Treatment. Boxes above represent number of patients out of 32 who experienced each side effect in each group. 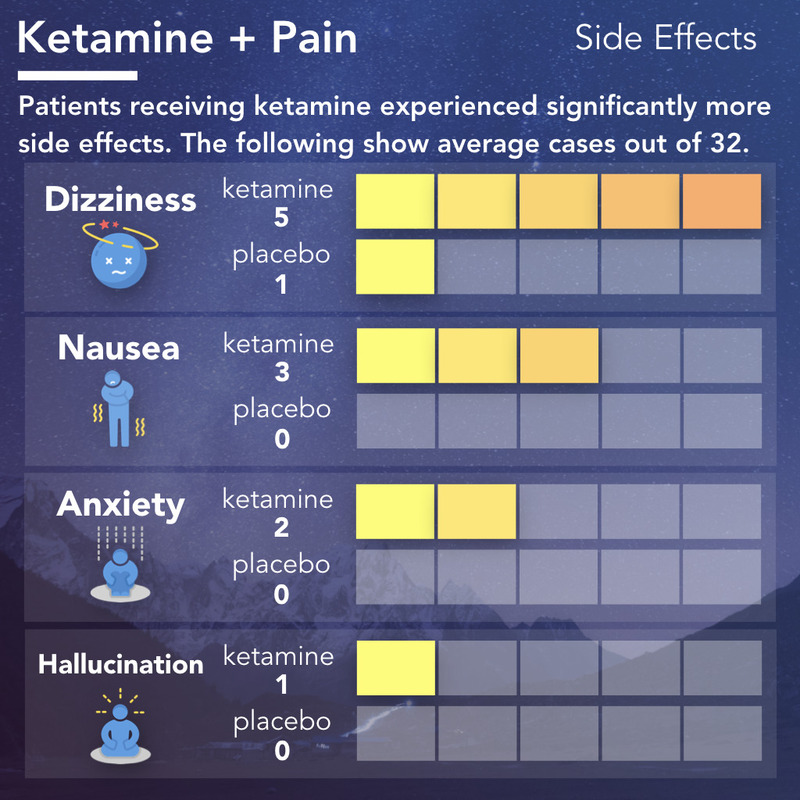 The two ketamine dose groups were averaged in order to provide a comparison with the placebo control group. These data show that ketamine may be a useful treatment for chronic pain patients who are not adequately treated with current options. Pain is difficult to fully treat with today's therapies. Any additional pain medication options would be immensely helpful to many patients. The side effects of ketamine are significant. For a patient who is in serious pain these may not be of huge concern. But, they are something for patients and their doctors to keep in mind. 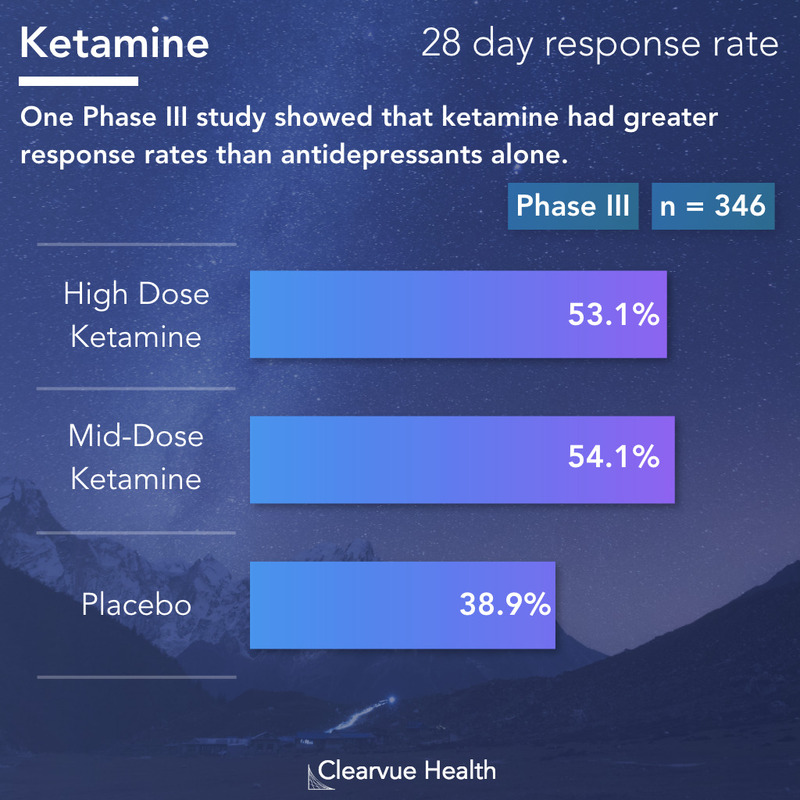 The data on the 24-48h effectiveness emphasizes that ketamine likely only works in the short term. However, this may still be useful for many patients since acute pain episodes often only last for a short while. This topic will require further study in larger clinical trials before it's approved. However, this is a great first step and does show some promise. Moreover, it adds to a growing body of evidence that "street drugs" may have useful therapeutic properties when used under medical supervision. The FDA recently approved ketamine as a depression treatment for patients who do not respond to other therapies. This represents the first approval of ketamine as a legal medication. 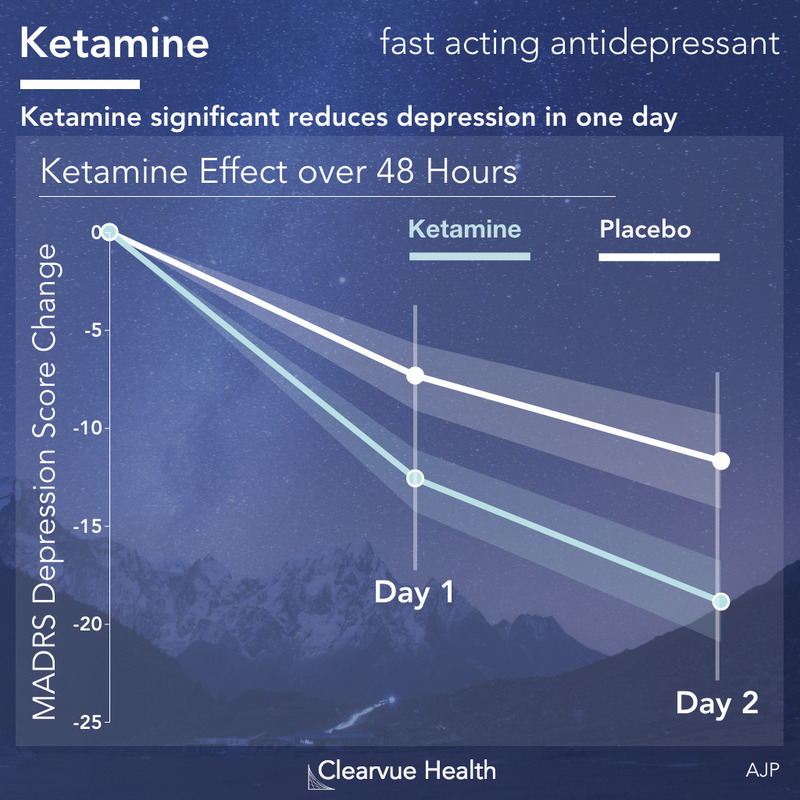 In clinical trials, ketamine showed effectiveness in treating depression symptoms. We've summarized the data behind this landmark decision by the FDA in the article below.